I have been continuing to look through the “Languages for the 21st century” booklets included with last week’s issues of the Guardian newspaper. Of all the things one might possibly say about Portuguese pronunciation, which are the most important? Opinions can legitimately differ on this point. 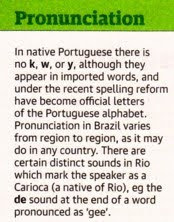 But I would claim that among the very least important is the fact that the writing system uses the letters k, w, and y only in foreign words, despite their being recognized as “official letters” of the Portuguese alphabet. Yet that is what the treatment in the Guardian’s Brazilian Portuguese booklet starts with and wastes valuable space on. What would I prioritize if I had to write one short paragraph on Brazilian Portuguese pronunciation? I would say that in very general terms it is similar to that of Spanish or Italian (since the reader is likely to have some knowledge of these). However, I would say that it is important to note that vowels in unstressed syllables undergo reduction, posttonic e becoming i and o becoming u. (This makes the general auditory impression very different from that of Spanish.) I would draw attention to the nasalized vowels and diphthongs and do my best to describe what they sound like: e.g. vão is like English vow, but with nasal escape. Yes, I would tell the reader about the spellings lh, nh, x, standing for [ʎ, ɲ, ʃ] respectively, and would attempt to describe the first two. I would say that in Brazil the spellings t and d before i and e usually stand for the affricates [tʃ] and [dʒ]. Neither the layman nor the phonetician can extract a meaningful description from the expression “hard ‘h’”. What would I say if I were writing this booklet? Perhaps that initial r and double rr are voiceless fricatives, like the ch in loch. And I don’t even know Portuguese. If you can’t say anything useful, say nothing. If the reader has no phonetic knowledge there is not a great deal you can do. So you ought to cater for the intelligent layman who does know a little phonetics and can understand such terms as “voiceless” and “fricative”. If you were writing about archaeology and wanted to discuss bronze, would you explain it as being a mixture of two kinds of melted stony stuff? No, you would say that it is an alloy of copper and tin. The technical term “voiceless” ought to be no more frightening to the general reader than the technical term “alloy”. “Velar” ought to be no more offputting than “tin” (the chemical element, not the container). Wikipedia doesn’t hesitate to use appropriate technical terms and technical descriptions. Why should a newspaper catering for an educated and literate readership be more timid? 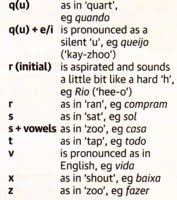 In another discussion I pointed out that initial r and double rr in Brazilian Portuguese usually have the sort of allophones you have given here, but voiced ones do occur. All sorts of pharyngeals and glottals, and is that an epiglottal implosive I hear?? This is a blow. There were eleven sound files for it, but now there are ten, and there is nothing now as dramatic as I heard before. Do they just take them down like that? I wish I'd copied them. There is a much more dubious one left which sounds as if it might be epiglottal. I can still guarantee the freak-out and the voiced realizations to anyone who's interested in checking it out. Yes, anon, and you don't go to a "train station" to catch it. This page of the booklet actually relates to a bus station (estação rodoviária). JW - do you think that the intelligent layman is familiar with words like "voiceless" and "fricative"? It would be interesting to hear your view about that, given your extensive teaching experience, because I have little idea how well-known phonetic terminology is. I remember hearing Joe Cornish on the radio talking about how he does a New Zealand accent, and he casually said something like "the sibilants are harder". On the other hand, I can't remember any mention of phonetics whatsoever in compulsory school. I would have guessed that the average non-chemist has a greater understanding of "alloy" than the non-linguist does of "fricative". What the Guardian readership will make of "hard h" is indeed anyone's guess, but at least it will steer them away from saying ˈɹiː.əʊ. Re. Wikipedia - have you ever contributed to that? Have you thought about recording sound files for the articles on the more obscure consonants? If they ever do this sort of thing again, I wonder if they could be persuaded to devote one booklet to simple explanations of linguistic and phonetic terminology, which could then be used in the remainder of the series. A vain hope, I suppose. Not that I'm necessarily arguing against your point; I absolutely agree that even basic descriptions of foreign languages should have proper linguistic terminology, so that those who understand it can learn something, and those that don't are no worse off. But certainly our technical terms are much more opaque than many technical terms of the physical sciences, which we learn in school (as opposed to linguistics). There's a difference between a technical specification of what to teach and the words used in the teaching materials. If the terms necessary for the specification are not familiar to the students, you have two legitimate choices: to substitute a more homely term for the technical, or to use the technical terms with a simple clear explanation. What is not a legitimate choice is to let the tail wag the dog — to explain only what can be expressed in familiar words. Actually, it's the written format that's the problem. In the classroom it's quite easy to convey the concept of voiced and voiceless without any terminology at all. David - I understand what you're saying. But the space constraints in those booklets are very tight. (In addition to your point about the written word, which is also true.) An explanation of all the manners/places/etc of articulation is surely not on the cards. And homely terms for "fricative" and "aspirated" and "velar" don't exist, AFAIK, because they are not everyday concepts. They are everyday THINGS, but language is one of those activities that we are much better at doing than at conceptualising. Maybe "whispered" for "voiceless" might have some mileage, though. What about "the sound you make when clearing your throat"? Or "like k except you don't fully block the flow of air"? [QUOTE]The technical term “voiceless” ought to be no more frightening to the general reader than the technical term “alloy”. “Velar” ought to be no more offputting than “tin” (the chemical element, not the container). I'm afraid "ought to be" doesn't come into it. Ought by whose standards? The fact is, most people, even highly intelligent, well-educated people, don't understand terms such as "voiceless" and "velar," if for no other reason that they are not exposed to them during the course of their primary or even secondary education. I had to learn what an alloy was in high school (or perhaps it was junior high) - and if I forget what it means (I might, as I don't work with metals), I'm not afraid to look things up or ask questions. So "alloy" holds no terrors for me. I know where to find and how to use a dictionary. Judging, however, by the number of people I know with advanced degrees who cannot successfully complete simple searches on Google, I am, though hardly unique, unusual in that respect. When confronted with unfamiliar terms, most people tune out altogether, or blip over the terms and read on in the hope that they will get the gist. Having been interviewed by several journalists about what it is I do for a living, I can assure you that as a rule they come remarkably ill-prepared, as they are not specialists in the field, and seldom think (or, perhaps, seldom have the time) to educate themselves on the subject beforehand. The newspaper "catering for an educated and literate readership" - not a safe assumption, I think - does not care enough to brief its reporters, or even its editors. It puts itself in the position of its most ignorant readers, and consequently gets things wrong. Hardly anyone outside the phonetics field knows what a diphthong is. I coach actors who either no longer remember, or who were simply never taught (or, worse, were taught incorrectly). None of the civilians I coach have even the smallest clue. I coach people (a few, anyway) who can't tell whether or not they are using their voices until I instruct them to place a finger gently on their Adam's apple (not yet a "voicebox," still less a "larynx") so that they can feel whether or not it is vibrating. Can't they hear whether or not they have used their voices to produce a sound? Apparently not. So expecting a general readership to understand terms such as voiceless, let alone velar and glottal, is asking rather too much of them. It would be nice if newspapers could find a way around that, but most newspaper departments are, I suspect, largely run by general readers. The solution, I think, is to teach these things in primary school, and to make them as much fun as possible. The solution is to awaken a spirit of inquiry and adventure in small children, and then not to dampen it as the children grow older. Then, when some of these children grow up to work in newspapers (assuming such things still exist), we may hope that as adults they will be interested in producing useful little pamphlets that their readership will enjoy and find genuinely helpful. I have successfully taught the rudiments of the IPA (for English, with a few "extras," not all the sounds) to children as young as nine. It can be done - indeed, rather more can be done. But most people don't care to do it. Asking it, therefore, of a newspaper that can't be bothered to learn the difference between a bus station and a train station, is tilting at moinhos de vento (I looked it up; I hope my source was reliable). None of my spleen is aimed at you, of course, John. I'm just grumpy about journalism. Right, phonetics in primary school. If only, eh, Amy? When confronted with unfamiliar terms, most people tune out altogether, or blip over the terms and read on in the hope that they will get the gist. The terrible thing is that they don't tune out altogether, or blip over the terms and read on in the hope that they will get the gist. They are ignorant of the extent of their ignorance, and therefore are unaware that they are tuning out to the extent of NOT getting the gist, and think they have understood everything just fine. It puts itself in the position of its most ignorant readers, and consequently gets things wrong. And newspapers are in business precisely to do all that. Not bad for 'voiced fricative', eh? As you say, the space constraints in those booklets are very tight. And while you can teach a little of a language in a very small space, I think these dimensions are just too tight to have any realistic expectations. The general aim is presumably to give a taste of what it might be like to study each language. The principle of giving a few phrases is sound, but attempts to give useful phrases like the coach times in Brazilian Portuguese or the formal introductions in Russian are a misguided choice. Most people who want to learn one phrase in an unknown language ask for something expressive like I love you or a scrap of politeness to which there is no problematic reply such as Hello. Knowing how to ask about timetables is of no use whatsoever if you have no equipment for comprehending the answer. Scraps of grammatical information may give a flavour of the learning task — provided that they're well chosen. I think John was justified in complaining that some of these scraps were just bland and dull. The scraps pronunciation information would have been better omitted altogether. In their place I would suggest some brief comments on what to listen to in the recordings. And given that they are in (very reduced) book form, they could make better use of the written language. Exotic labels, signs, tickets and the like can be quite appealing. On a positive note, the diagrams of gestures were a nice idea. The Guardian could learn from the BBC, which gives quite nice tasters of what it might be like to study Russian, Polish etc. See here. So [quote] doesn't work and we now see <quote> doesn't work and can't even be seen not to work. John, is there any guidance anywhere on which tags are allowed and/or work? I hope Amy and Leo sort out which bits are quoted from their posts and which are my responses to them. There is nothing inconceivable about buses being available at the train station, I suppose. It is not technically so in New York City, as one must walk a block or so from the train station to find out-of-town buses (and the street corner you catch them on is certainly not a, never mind the, bus station), but it is so in our neighboring metropolis of Jersey City. e ... as in 'madden', eg pesar. I have no idea what this is supposed to mean. I'm no expert in Portuguese phonology, but I believe the first syllable of "pesar" would normally be /e/, not schwa (let alone syllabic [n]!). No mention is made of orthographic 'e' corresponding to /e/ or /i/. For orthographic 'o', they do better by getting 2 out of 3 possibilities, but no mention is made of /o/ as a possible realization. No mention is made of any nasal vowel other than "rang". l ... when at the end of a word, sounds like 'wl', eg Brasil. Why 'wl' rather than just 'w'? Or, indeed, "roughly as 'l' would be pronounced in most of southern England"? The use of 'm' and 'n' syllable-finally to nasalize the preceding vowel is not mentioned. No mention of double 'r'. s + vowels meaning "intervocalic s". /d/ becoming /dʒ/ before /i/ is mentioned, but not the parallel change of /t/ to /tʃ/ in the same environment. x as in 'shout': "x" can actually be pronounced in various different ways. No mention is made of word-final orthographic 'z' corresponding to /s/ . And, best of all, "Brazilians do open their mouths wider than the Portuguese, and are therefore theoretically easier to understand. " BrPg [(w)ɫ] vs euPg [w], and the fact that NNSs find Brasilian Portuguese easier to understand because vowel "reduction" is limited - is that so far off the mark? ... Russian words are pronounced more or less exactly as they are written. This is true only for texts with the stresses marked. Among the very first tasks of any learner who uses written materials is to learn the sounds of stressed and unstressed vowels. At beginner's level you don't need to worry about this, but try to get into the habit of imitating the way Russians speak. However, they spend a disproportionate amount of space describing what not to worry about. The most demanding task in learning Russian pronunciation — one that begins relatively early and seems to last for ever —is to master the hard~soft consonant distinction. Of course, this can't be described in a little work like this, but they could have forewarned potential learners that this was something new and exotic to explore. Another learning task they might have alluded to is mastery of the extraordinary (from an English viewpoint) consonant clusters. Yes, there's a danger in telling the potential learner too much about the difficulties. But I think there's a greater danger in promising simplicities that will almost immediately be contradicted by experience. Far better, I suggest, to warn that the difficulty exists, but to reassure the punter that they won't need to master everything immediately. @mallamb: "homely terms for 'fricative' and 'aspirated' and 'velar' don't exist"
True as far as it goes, but you can make do with "hissy/buzzy" or "steam escaping/motor running" for fricative; "breathy" for aspirated; and "soft palatal" or "back of tongue to soft palate (the spongy bit of the roof of your mouth" for velar. It may not be elegant, but it can be at least a little helpful. BTW, I only decided to go with [QUOTE] [/QUOTE] earlier just so I wouldn't have to adjust all the double quotes to single quotes, leaving the double quotes only on the outside of the quoted material. That's inverted commas to those of you in Rightpondia, and of course you do the doubles and singles the other way around from Leftpondia. Gracious me, this communication stuff is very difficult! Can't you leave the double inverted commas in and put the whole thing in inverted commas? We can. We seem to me to be on the right side of the pond for a lot of things. Of course if someone has used single ones you can put the whole thing in double ones, as you wish to, but you can do either provided you are on the right side. I had decided to adopt italics for quotes until you tried experimenting and I rashly tried a bit more. And it seems to have had the consequences I said I hoped to avoid. You seem to have attributed the quote about homely terms to me, who was making the same point as you, namely that you could use words like buzzy as the Hindi pronunciation guide had. Can't you leave the double inverted commas in and put the whole thing in single inverted commas? We can. We seem to me to be on the right side of the pond for a lot of things. Amy - Mallamb is right, it was my comment about "homely" terms that you didn't agree with, not his. Maybe I'm wrong, I just wouldn't have thought that words like "buzzy" and "breathy" (encountered in a booklet) would enable the layman to start correctly categorising voiced/fricative/aspirated etc sounds as such in his own mind. But then, I did think that "whispered" would work for "voiceless", so clearly I'm just guessing here. I defer to your experience. My point is that within the confines of a very short booklet, you might be better off simply equating the sounds of the new language with those that the reader already knows, rather than trying to foster a systematic understanding of phonetic principles. @Leo, mallamb: Sorry about getting your posts confused! @Leo: I'm not sure my experience is worth deferring to where newspaper pamphlets are concerned! You do have a point about comparing sounds of a new language with those of one the reader already knows. But speaking only for myself, I often find that approach unsatisfying when I encounter it as a reader. @Mallamb: As to the description of Hindi ʋ, not bad at all! As to phonetics in primary school, I can dream, can't I? We have something here called phonics that mystifies me, but that's probably because I was a very early reader, and don't really remember struggling to learn. I do find myself wondering what the point of this pamphlet series is. What purpose is it meant to serve, exactly? Nobody now begins a foreign language course with phonetics. But just over forty years ago I worked for the Instituto Schenker in Rome, which did just that. The master stroke was to advertise one-to-one tuition while actually doing all the teaching on tape. The expensive 'teachers' simply administered tests on what they'd learned on tape, spent a little time conversing, then prepared them for the next test. The 'oral tests' were marked for pronunciation. At the end of each line, if there was a pronunciation error, the teacher would say 'No', pencil a cross and read out the correction. The student would repeat the correction and carry on. To pass, he or she had to complete the lines within one minute, despite interruptions and repetitions. This was in the days before students owned their own tape recorders. So much of their pronunciation homework was done on paper. To that end they had to learn Daniel Jones-type RP and transcription. A neat twist was to obscure all the word junctures, so that the Italian students wouldn't be tempted to add little vowel sounds. Here are links to the phonetics test preparation and two tests from the Schenker teacher training course: one for reading phonetic transrcipt staccato, and one for reading legato. I was a less modified RP speaker in those days, but even so Schenker's desired æ gave me trouble. I'd had a head start with transcription, though. I spent a couple of evenings giving practice dictations to my fellow trainees — in a restaurant with paper tablecloths. The exact purpose of the pamphlets is to encourage people to buy the week-day Guardian and the Sunday Observer seven days running. Most, perhaps all British newspapers include give-aways from time to time — nowadays often a CD or DVD. A few papers, including the two in The Guardian Group like to produce giveaways in sets of six or seven, tempting at least a few readers to keep buying the paper(s) for the whole week. Other formats are sets of wall-charts and wrapping paper designed by celebrities. Not long ago, the Guardian gave out a series of pamphlets on the Romantic Poets. The booklets are also promotional material for the Teach Yourself series. The publisher provided much of the content and the back page of each booklet details a half-price offer on all Teach Yourself language titles. Previous marketing campaigns along these lines have presumably been successful. The Independent gave away CDs of Teach Yourself materials for the usual 'holiday' languages. The Guardian gave away CDs and little phrase books from Michel Thomas materials. The UK public, it seems , has a taste for samples of self-study language teaching materials. This recent series Languages for the 21st century experimented with a couple of changes: a switch from the usual 'holiday' languages, and a feature by a reasonably well-know native speaker on what it's like to be a speaker of Japanese etc. It may well be that the lack of proportion in the booklets is due to some editor at the Guardian selecting samples on the basis of what will fit into the relevant little page or pages in the booklet. We would need to see the originals to judge the quality in context of the pedagogy and the phonetics. Correction. What the Guardianand Observer gave away in the previous Spanish and Italian promotion was a combinations of two CDs from Michel Thomas and five little phrase books described as 'exclusive' — apparently commissioned by the paper. These are the series referred to by John in the links in the opening of 'more Guardian phrasebooks'. These new booklets suffer in comparison. They weren't commissioned, and they force too wide a range of information into the format devised for the phrasebooks. Phonetics has been tried out in British classrooms! The script used was not IPA but the similarly titled ITA 'Initial Teaching Alphabet'. Like IPA, it was supposed to haver a distinct symbol for every sound (though of English only), but I believe that its creator (one of the Pitman family) also tried to make each new symbol resemble one of the digraphs that commonly represented the sound. The plan was that children would learn to read using the more rational ITA. Then, a year or two after they were established as readers, they would be moved on to standard orthography. The argument as that they would be addressing the difficulties of English spelling separately from and later than the fundamental problem of literacy. It didn't work. Yes, children learned to read. But the transition to standard orthography was a muddle. Virtually no books outside the classroom were printed in ITA. Parents couldn't read ITA. These were all practical difficulties which just might have been overcome with time and with care. But there was a fundamental design flaw; far too often the ITA texts represented a pronunciation that was locally alien to the accents of both children and teacher. I find it hard to believe that the ITA was used in Scotland. I expect it was used in Wales, which then shared an educational system with England. By the way, in the whole of the UK 'synthetic phonics' is now the only officially approved methodology for the teaching of reading. @David: Thank you for all your helpful answers! ITA sounds like the reading equivalent of the New Math. I was in my 30s before I got over that disaster; I took an extension course called Overcoming Math Anxiety, which was like group therapy for people who were afraid of numbers. In case it wasn't clear, I wasn't actually suggesting that the IPA be used to teach non-readers to read; only that it be taught as an additional, somewhat related subject, so that kids could learn more about how they make the sounds they make (which is a lot of fun, if you ask me). Oral gymnastics, as it were. Of course, I have "revolutionary" ideas about the need for more arts in schools, especially music. Call me madcap, but I think phonetics fits right in. They really ought to teach how everything is connected, if you ask me. The Schenker stuff is bizarre, and strikes me as particularly soulless. Personally I have no trouble with [æ]; mind you, in Italiano, it should be [a] ... Oy, vey. Doing Schenker was actually great fun. And some of the punters really liked it. An Air Force sergeant once told me how much he was enjoying it because English is such a musical language! Because of Italian [a], we were expected to teach the sort of [æ] that had gone away in the fifties with 'advanced RP'. Oy, vey indeed, Amy. "Oral gymnastics" is an idea of genius. And it could be started in kindergarten, never mind primary school. Funny faces for the kids, and in due course comprehensible staff in call centres for us. But with a heavy heart I have to disagree with David about phonetics having "been tried out in British classrooms". ITA was emphatically not phonetics and I have read quite enough about "phonics", "synthetic" or otherwise, to be convinced that it is the menace you obviously suspect it to be, and documentaries about the way it is actually taught by celebrated practitioners have filled me with horror. But for all that, even "synthetic phonics" is a step back in the right direction. ITA was a grievously missed opportunity. I predicted it would be when I saw the initial proposals. There had been others, but opting for the Pitman system, in the apparent belief that the genetic inheritance of its inventor alone guaranteed its success, was only a guarantee of disaster. My predictions were vindicated, in all the hair-raising ways David mentions and more, and now we have even more people who can't read, let alone spell, or man call centres, than we would otherwise have had. I had a split second of horror at the delusional possibility that anyone in the IPA could have given this abomination a moment's thought, never mind sympathy. I know you meant the ITA, but no thanks. But Earth hath not anything to show more fair than your Istituto Schenker stuff! The method used in your time is dead, buried AND decomposed, I suppose? Even the neat twist of obscuring all the word junctures? Obviously I have tried that too, but on the Japanese – a bit more of a challenge than Italians. I think I might have done better if there had been a LASS in the schools and universities, rather than generations of people more challenging than the Italians! Don't change a thing! That voice is absolutely you! It is you, isn't it? You sound incredibly young. It may be because of the age of the recording that in http://web.me.com/davidcrosbie/Site/Blog/Entries/2010/2/17_schenker_-_teaching.html there are blips such as unaspirated plosives in "kEnglish" and "Italian". And did you put the ɡ back in the odd "English" in the recordings out of a sense of the unwisdom of the transcription you had to work with? I dare say we teachers used to aspirate the kiŋ in English. But I bet the students didn't when they copied us. I can't remember for sure that Schenker omitted the g in the transcription. As you've probably guessed, the other teacher-training phonetics tests weren't nearly so crazy. Yes that voice is me — apart from the æ which I was consciously trying to modify. I can't see the Schenker Method outliving Schenker. He was a real character — Polish, and spoke like Daniel Jones. He encouraged a mystery as to how he came to be in Italy. The most plausible explanation is that he'd fought in the Free Polish Army. Nowadays, punters would be shrewd enough to spot that the 'one-to-one tuition' wasn't teaching. And people now have constant access to recorded sound. They don't need to do pronunciation homework in silence. They'd probably also see through the claim of 'programmed learning'. Students were constantly taking a 'written exam' (tranlation from memory) at one level and an 'oral test' at a level at they'd already passed the 'exam'. When they reach level 5:5, they'd take a multiple choice 'Level Exam'. If they failed, they had to retake the exams and tests for levels 1-5. And so on. Programmed learning, see? progressing at your own speed. And the beauty of it was that teachers not only didn't teach — they weren't even needed for most of the testing. Only the 'oral tests' (speaking a prepared texts with few or no pronunciation errors) had to be marked by teachers. I shouldn't knock it though. The students got their money's worth. We had good fun, and actually did some teaching in the middle bits of the 'lessons'. And I acquired skills that have vanished now — chaining, back-chaining and all the tricks of psychomotor drilling. Oh I do hope you realize I wasn't knocking it, David. And I have observed how true "freedom fighters" tend to have the best Methods. Oh I see all right. I've seen what farcical window-dressing that can be. The fact that so many of my dealings have been with Japan must be starting to be painfully obvious, and what I say of Japan is that in my experience at any rate it seems to be truer there than anywhere that not only do teachers only pretend to teach but students only pretend to study. This seems new to me.. can you elaborate further?